Ten stories from international bestseller C.J. Box, full of dark deeds and dangerous impulses. 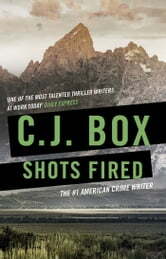 In 'Shots Fired', one of four Joe Pickett stories, Joe's investigation into a radio call threatens to become his last. In 'Pirates of Yellowstone', two Eastern Europeans, strangers in a strange land, find our just how ruthless American tough guys can be. In 'Le Sauvage Noble', a Lakota Indian takes a job at Disneyland Paris acting the 'noble savage' until he meets a woman who shows him what savage really means. These gripping tales are proof, once again, of why Box is a force to be reckoned with.